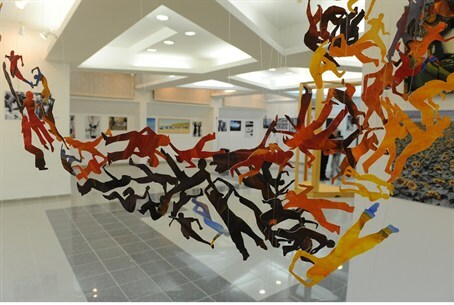 Nefesh B’Nefesh and the Ort Braude Academic College have launched an art exhibition to display the creative talents of Western Olim. Nefesh B’Nefesh, the organization that is dedicated to revitalizing ‘Aliyah’ (immigtation) from North America and the UK by minimizing the financial, professional, logistical and social obstacles of immigration to Israel, has undertaken a cooperative venture with the Ort Braude Academic College of Engineering in Karmiel to produce a special art exhibition designed to display the unique creative talents of Western ‘Olim’ (new immigrants) living in northern Israel. The exhibit titled “From There to Here”, which is the first collaborative exhibition of its kind, showcases a variety of works from fifteen new immigrant artists who live in northern Israel. The works of art span a range of artistic expression, including photography, paintings, installations, and more. Many of the featured artists made Aliyah through Nefesh B’Nefesh’s “Go North” program, which was launched in 2009 in an effort to encourage new immigrants to settle in northern Israel. The “Go North” program, which provides resources, support and assistance to new immigrants wishing to make their new homes in northern Israel, is supported by Keren Kayemeth L’Israel and the Russel Berrie Foundation. The opening of the art exhibit took place on January 5th, at the Lady Roslyn Lyons Gallery on the Ort Braude Academic College’s campus, in the presence of over 100 Israeli art enthusiasts, Nefesh B’Nefesh staff, family and friends. The exhibit will remain open through February 28, 2013. The support provided by Nefesh B'Nefesh to the 33,000 newcomers that have immigrated to Israel since the organization’s founding in 2002, has ensured that 97% of its Olim have remained in Israel.